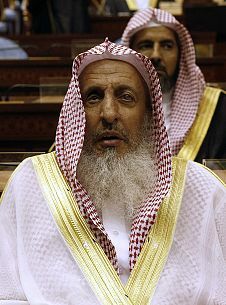 As the Grand Mufti, Sheikh Abdul-Aziz ibn Abdullah Aal Al-Sheikh has the highest position of religious authority in the Kingdom of Saudi Arabia. He is an Islamic scholar based in Makkah and has influence as a leading cleric of the expansive global movement of Salafi Muslims. Salafi Lineage: The Aal Al-Sheikh family in Saudi Arabia traditionally controls the religious and justice establishments. They are descended from Muhammad ibn Abdul Wahhab (1703–1792), the founder of Wahhabi and Salafi thought, and for 250 years have been closely associated and intermarried with the ruling Al-Saud family. Head of Sunni Jurisprudential Committees: Sheikh Abdul-Aziz Aal Al-Sheikh is chairman of the Council of Senior Scholars, a scientific consultative commission composed of leading Sunni specialist scholars of Sharia (Islamic law). He is recognized for his influence in enforcing a distinct view of Islamic tradition. In 2008, he publicly criticized Muslim televangelists who encouraged Muslims to celebrate birthdays and anniversaries. He has also been robust in his condemnation of Turkish soap operas sweeping the Arab World, calling them distracting practices. He is also ardently opposed to the practice of marrying off very young girls to older men, emphasizing its incongruence with human decency and Islamic tradition. Central Figure of Global Salafi Movement: As Grand Mufti of the Kingdom of Saudi Arabia, Al-Sheikh is the leading religious figure of the Saudi based network of Salafi Muslims. The rulings derived by Al-Sheikh are based heavily on a literal reading of the Qur’an and emphasize the need to strip away past interpretations that have become a part of Muslims’ lives. The movement he leads is characterized by an authoritative stance on Islamic religious practice. He has described DA’ISH as ‘evil’, and called them ‘the number one enemy of Islam’.